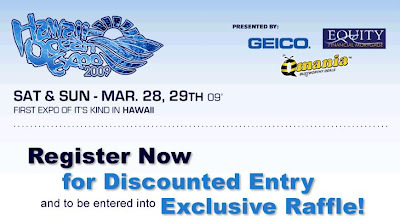 We're proud to announce that the team at Hawaii Ocean Expo is providing $3 entry with Qmania (instead of $5) to their upcoming inaugural event at the Blaisedell Exhibition Hall. The event is the first of it's kind in Hawaii, and will connect and cross promote all ocean-related industries under one roof. The even will be this Saturday and Sunday (Mar. 28 - Mar 29) at the Blaisdell Exhibition Hall. If you're local or in the area, this expo is a must. Register here for discounted entry -- and to be entered into our exclusive raffle.